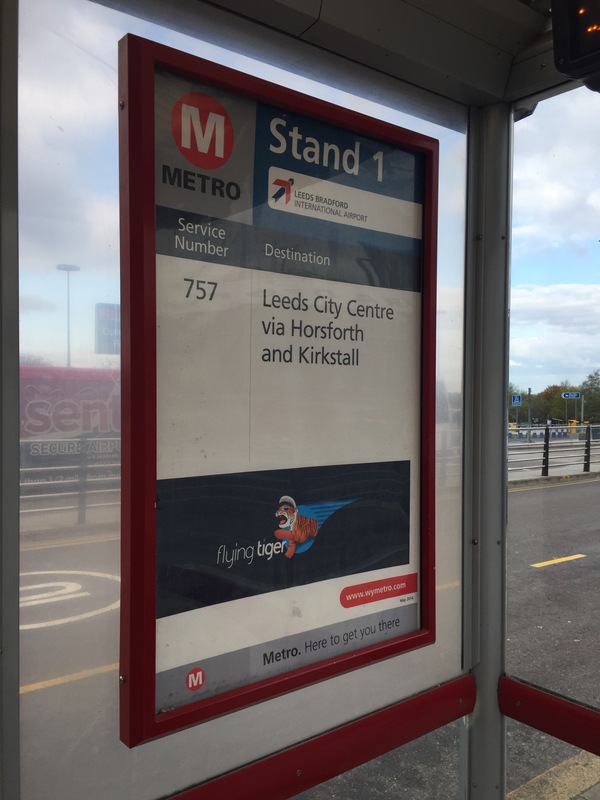 A few weeks ago I travelled into Leeds Bradford Airport on a flight with the aim of getting back home by either a taxi or public transport. Walking out of the terminal past the car park bus that I am used to getting on and heading towards the bus stops, I was very expectant that I was close to home. The taxi operator had an accessible pre-fab hut, with two women providing fare information to waiting passengers. I was impressed until they advised me that it was £18 for a taxi journey home. I value my time but I also value the cash in my wallet. I stepped over the hole that my jaw hitting the floor had made and walked towards the bus stops. The grey-white shelters stand proud with passenger information screens providing information about the next bus service at those stops. The standard timetable known to everyone in West Yorkshire provides the basic schedule. Thats it! The first thing you see if you dont have a car or pay for a taxi at Leeds-Bradford airport are a few bleak shelters. They lack information essential to make an informed decision. This includes prices and map information. I’m not the only one with concerns about the route. Passengers were asking me about fares and were very unsure about what they should be doing. It is easy to forget that other countries do buses differently. Many operate fare systems that demand payment is made before getting on the bus. Some operate vicious penalty fare schemes using undercover inspectors. The lack of information fails to reassure passengers who are potentially feeling vulnerable and unsure at this stage of their journey. Look at this poster. Covered in logos of organisations that are involved with the bus stop, telling people that this is the bus stop for Leeds via two places that many of those looking at it probably haven’t heard of. The timetable sits forlorn in another case. There is no map and no ticketing information. The eagle eyed will even notice the date in the corner. It was last updated in May 2014. It is not a convincing argument to use the bus. A little bit more information on this poster would help passengers make a more informed decision. Identifying fares, including a single ticket, day ticket and the weekender. Information about the weekly ticket and how it can be bought. A map of the route (including information about where you can interchange (Kirkstall is quite a hub on the quiet). There are a few other helpful changes that could help passengers. The buses are not fantastic on these routes but there is hope on the horizon. With a stronger seating plan and passenger information screens, these buses will finally strengthen the link. However, without the supportive information at Leeds Bradford Airport, they won’t get the patronage they could have. There is a challenge for improving the public transport offering at the airport. In a competitive market, airports need to exploit all possible revenue streams. Airport parking is increasingly important as is the rights to provide taxis. Better public transport isn’t immediately lucrative. However, a strong transport offering brings in more people. A few tweaks could really help it.